An original oil on canvas which was exhibited at The Royal Academy in 1921. 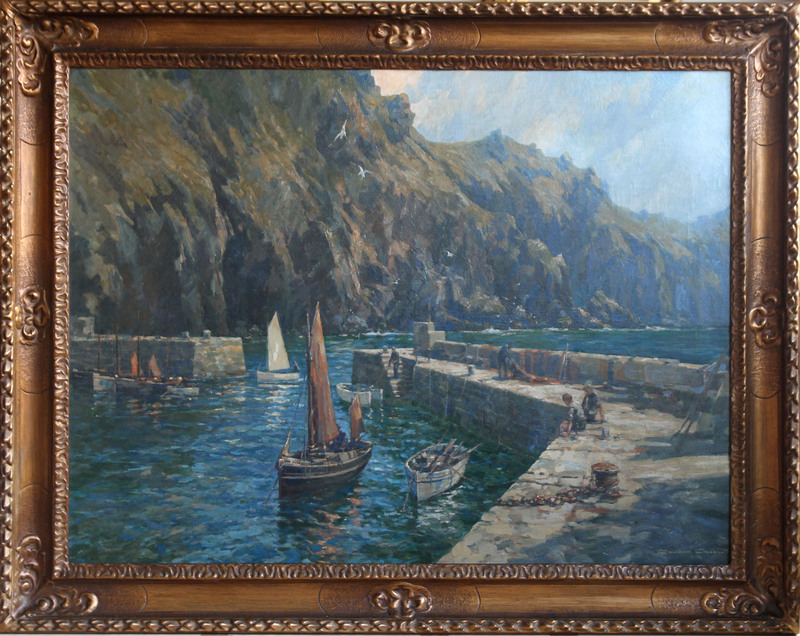 It was painted by the British artist Gordon Crosby and depicts Mullion Cove in Cornwall. A huge painting, it is a fine expansive marine of the Cornish fishing harbour in wonderful Cornish hues. Original gallery exhibition frame. 57 inches by 45 inches. Gallery condition. Much of Crosby’s for-hire work was done for The Autocar magazine and saw its greatest heights in the 1920s and 30s. 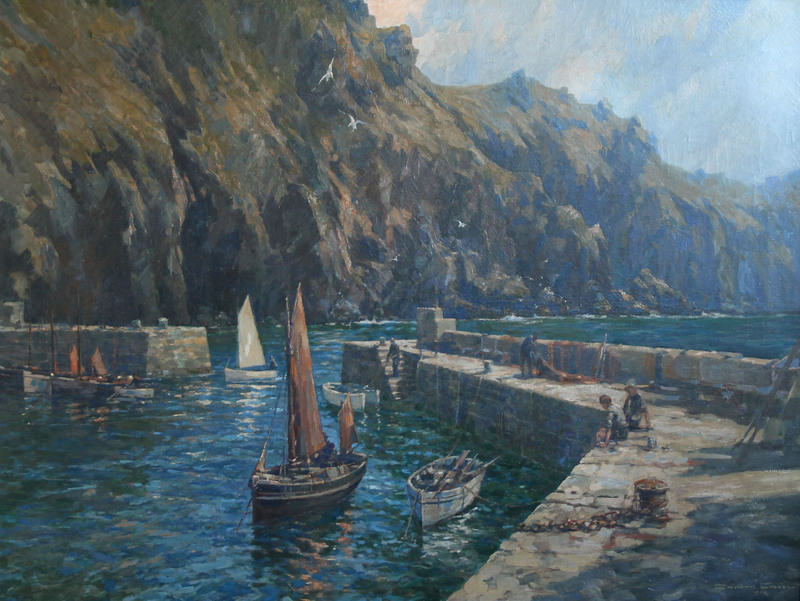 The author, too, worked for The Autocar, as a reporter, starting several years after Crosby’s death, and came to find that he would recognize locations he was sent to on assignment from the Crosby paintings he had so admired in his childhood. This affinity for his subject informs the writing. Making a distinction between “illustrator” and “artist”—and placing Crosby somewhere in between—Garnier introduces Crosby by describing not just his style but his sensibility. Crosby had not gone to art school or received any sort of formal art training but instead started his career as an engineering draftsman at Daimler (famously calling his colleagues “draughtsworms”). This facility for technically accurate renderings and an eye for proportion stood him in good stead later on in his paintings of machinery but failed him in his attempts at showing the people populating his pictures in an animated, lifelike manner. He was much more at ease planting people into his cartoons where their sketchy, wooden features did not seem a deficiency. Garnier paints his own picture, in words, of the rather unique circumstances of Crosby and his cohorts starting out together. It is a quintessentially British story in terms of lifestyle, schooling, social circles, decorum vs. rebellion etc. From among Crosby’s early acquaintances would come lifelong friends and professional collaborators: S C H Davis, Monty Tombs, W F Bradley, M A Millar, to name but a few. Garnier describes them as “a household of young people, all of them mad on cars and keen to establish themselves in good jobs in the infant motor industry.” A picture emerges of a lively “charmer of the first order,” unorthodox, and disdainful of authority. An even more volatile combination as he became increasingly sure of his talent and the place in the world it accorded him. The book describes his interests, working life, and freelance work but it is not a conventional biography. Little is said of his family and private life and it would be easy to miss the one sentence that explains that Crosby died of his own hand at the age of 58, devastated by the loss in combat of his oldest son, Peter, a World War Two RAF flyer who had begun to make own name in motoring art. He exhibited four works at the Royal Academy.